The Memphis rapper was in North Carolina for CIAA Weekend when he was shot at multiple times. Rapper Young Dolph might just be bullet proof. The self-proclaimed "King of Mephais" was shot at up to a hundred times last night in Charlotte, North Carolina while in town for the Central Intercollegiate Athletic Association (CIAA) Tournament Weekend. No one was injured in the shooting and the incident is still under investigation. According to Charlotte police, the shooting took place around 6:30 p.m. near an apartment complex at the intersection of 8th and North Caldwell Street, reports The Charlotte Observer. 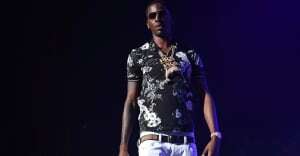 Despite the shooting, Dolph later went on stage for his scheduled performance with Migos and 21 Savage at the city's Cameo Night Club. Video of the shootings aftermath made it's way around social media, check it out below.